I have been waiting and waiting to work on styling our deck for the summer, and I am so excited to show you how it turned out! I’m starting with the table, since it really is the heart of our summer entertaining. The flowers I chose were the jumping-off point for the entire deckor. (See what I did there?!) I picked up a few items at our local grocery store, from their Joe Fresh line (gotta love reasonably-priced housewares), and the rest was “sourced” from our own cupboards. The chair cushions are also new this year. I found three of them at our local Giant Tiger (again with the reasonably-priced housewares), and the fourth… Well, let’s just say that I spent more in gas driving to Valleyfield than I did on the actual cushion. No matter! It was worth it because they are the perfect shade of coral. 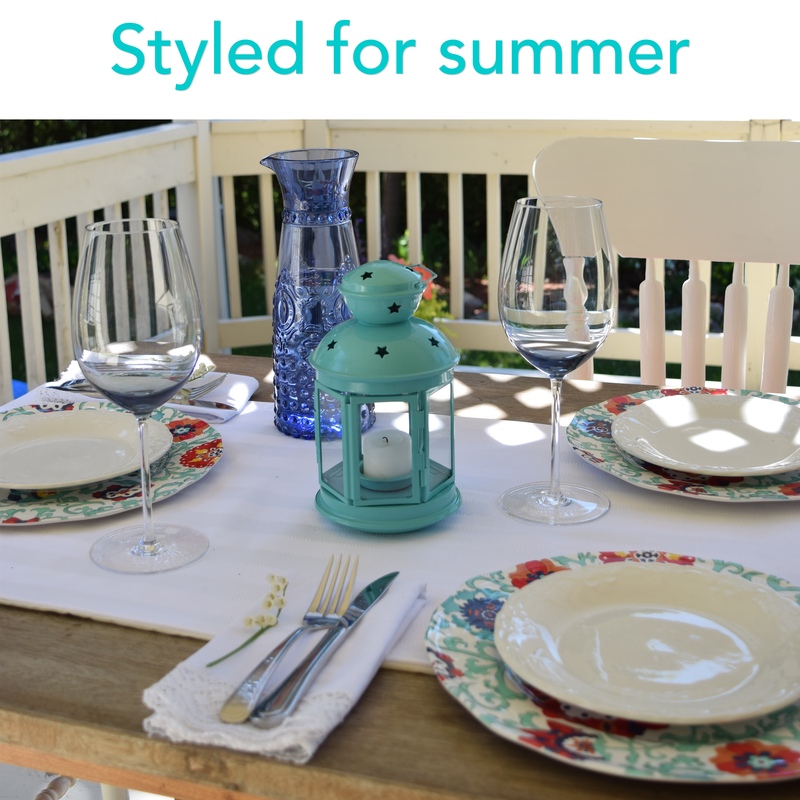 The floral charger plates, turquoise lanterns, and knobbly blue decanter are from Joe Fresh. My mom gifted us with the lanterns, and when I saw the matching plates I knew that turquoise would be our accent colour. I’m so pleased with how the decanter is exactly the shade of the blue salvia in the planters. God, I love when things match. You might be wondering about the white table runner. Well guess what?! I made that! Yup, one evening I decided that I needed a break from prepping for school concerts, so I whipped up this table runner. Not even kidding! I thank my lucky stars that my mom has been teaching me to sew, because I finally feel that I have enough basic skills to actually pull off this sort of thing. Before, I’d try to sew something like this and it would end up a big mess and just lie, unfinished, in my fabric box. But no longer! I’ll be posting a tutorial for making this runner really soon! Stay tuned for it. The lily of the valley was blooming beautifully these last two weeks, so I couldn’t resist adding a touch of it into the table setting. So now that the table is set and ready to go, it’s time to fire up the BBQ and enjoy this gorgeous, early summer! Cheers! This post was featured at Savvy Southern Style and Oh My Heartsie Girl! Gorgeous setting! I would love brunch or lunch out there. Gorgeous table setting! Perfect for summer evenings! Now…the next question is; what’s on the menu? Thanks so much, Loretta! Glad you liked it and thanks for stopping by. Looks fantastic! We have new deck furniture ordered… I frantically check my email all day waiting to see that it’s shipped! What a lovely table setting! I love the coral and turquoise. Thanks for linking up to the Bloggers Brags Pinterest Party. I have pinned your post to the Bloggers Brags Pinterest Board. Hope to see you next week! Love it! Looks like a wonderful place to have dinner with friends… the colour palette is beautiful! Awesome! One of the best colour combos going right now! What a happy and cheerful setting! It would make all of us want to dine out with you 🙂 Thanks for sharing this lovely post at Together on Tuesdays!!! Awesome – we both are music teachers, too! I totally understand the insanity of May. I’m a High School band director! Hooray for band! My schools just finished their concerts – hallelujah! Congrats! Our last day of school was yesterday! Well, you’ve just proven summer is back! Those are some lovely and inspiring settings! what a gorgeous back yard! the colors are great!! This set up is so lovely! I love the teal lanterns. And your post’s title is really clever. 🙂 Thanks for sharing at Merry Monday, hope to see you again next week! You make a great hostess, I love your table setting, it is really fun for a summer meal. The turquoise is such a pleasant colour! What a lovely set up; the weather looks perfect for some outside dinners on a nice shady deck! Like the colors and great idea. What a lovely table setting. This looks so inviting and I love your colors. Thanks for hosting! Glad you enjoyed the post.